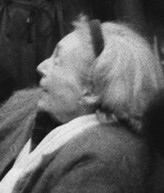 Marguerite Donnadieu, kent as Marguerite Duras (French: [maʁ.ɡə.ʁit dy.ʁas]; 4 Apryle 1914 – 3 Mairch 1996), wis a French novelist, playwricht, screenwriter, essayist, an experimental filmmakker. Her script for the film Hiroshima mon amour (1959) earned her a nomination for Best Oreeginal Screenplay at the Academy Awairds. This page wis last eeditit on 12 Mey 2018, at 19:24.